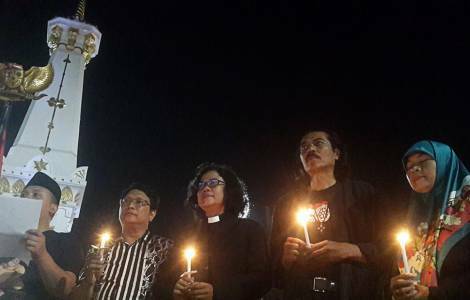 ASIA/INDONESIA - Attacks on three churches, the Catholic parish priest: "Let us forgive the terrorists"
Java, just before the start of Sunday Masses. The first explosion took place in the Catholic Church of Mary Immaculate at 7.15 am; the second in front of a Pentecostal Church and the third in the Church of Christ (Anglican), five minutes after the first attack. A new attack hit a police station in Surabaya today, Monday, May 14: the total toll of the victims of two days of violence, as reported by the authorities, has risen to 25 dead (of whom 13 suicide bombers) and more than 50 injured. According to Indonesian police chief Tito Karnavian "the perpetrators of the attacks on churches are all members of the same family: father, mother, two sons and two daughters, involved in the attack. We identified the group, Jemaah Ansharut Daulah (JAD) as the organizer of the attack". The attacks generated fear and pain in the Indonesian Christian community. The parish priest of the church of Mary Immaculate, Fr. Alexius Kurdo Irianto, told Fides that the explosion in front of his church killed five people: three are his parishioners and the other two are young suicide bombers, as well as several wounded. After the explosion, says Father Irianto, "Catholics in the diocese of Surabaya, are in deep pain, but the Catholic Church is not afraid of terror". Among the Catholic victims, Aloysius Bayu was a newly-baptized young man, who was the coordinator of the parish security service, "who died because he blocked the two suicide bombers, otherwise the explosion would have caused more victims", explained the parish priest. "We vigorously denounce such terror and reject all forms of violence, because they are incompatible with the dignity of human life and are contrary to any religious teaching", adds Fr. Irianto.